Home » Model Horse	» BreyerFest 2017 Special Run Holi the ELEPHANT! BreyerFest 2017 Special Run Holi the ELEPHANT! 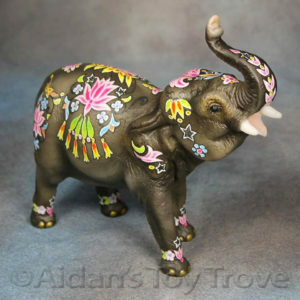 Breyer revealed the BreyerFest 2017 Sneak Peek #7 to be Holi the Elephant. How cool is that?! Off the top of my head, I think that the Elephant mold has only been largely released in a variety of greys and copenhagen blue! 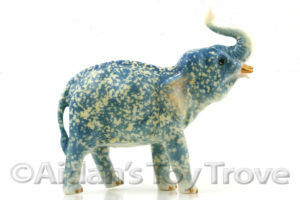 There are some other very rare unique colors of Breyer Elephants floating around. Pictured below is Nimbo who we happen to have listed for sale on eBay. Holi will be sold at BreyerFest 2017 in the Breyer Bazaar which I believe is the popup tent. Historically, I personally have had bad luck acquiring BreyerFest popup tent special runs but we shall see what luck this year brings! 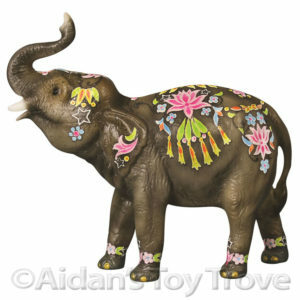 Let’s meet the first member of our Breyer Bazaar line-up – Holi! Holi is a warm grey elephant with a spattering of freckles across the face and ears. Holi is a Hindu festival that celebrates the triumph of light over dark/good over evil and signifies the start of spring. The festival is celebrated throughout India and concludes with a day of fun that involves celebrants chasing each other with colored powder and water. Holi is decorated with a colorful spring pattern of flowers, plants, and stars capturing the spirit of this beautiful Hindu celebration and as a nod to the painted elephant festival that is held each year at Holi in Jaipur, India. There will be plenty more friends joining Holi at the Breyer Bazaar so keep an eye on the Breyer Blog! Here is a link to my blog post about Holi’s initial sneak peek. 3 Responses to BreyerFest 2017 Special Run Holi the ELEPHANT!